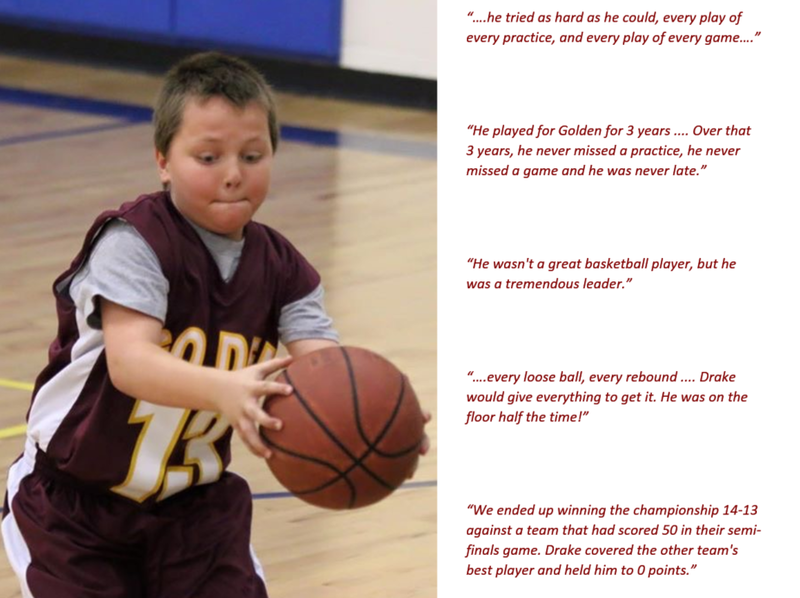 By all accounts Drake Durkee was one of the kindest, hardest working and most tenacious defenders to ever play for Golden. Drake's spirit, passion, work ethic and coachability are traits GYBA hopes to instill in all our players. We are excited to announce that the 2017-2018 GYBA season will be the second year that the Drake Durkee Hustle Award will be presented to that student athlete within the GYBA program that best represents Drake's spirit and hustle. The award will be given to two members of GYBA each year, one boy and one girl, that display the hard-working, defensive minded spirit that Drake brought to his team every time he touched the floor. Nominations for the award will be taken in January (more selction criteria will be distributed to the coaches prior to then), and the selection committee will chose this season's winners in February. The award will be presented to the winners at half-time of one of Golden High Schools' home basketball games.